If I were younger and less jaded in my ways, I have to concede that I would find Kinect Star Wars utterly enthralling. After all, this game is all about putting the player in the shoes of a Jedi, and this has been a childhood dream of pretty much every bloke I've ever met who was young enough to enjoy the films when they were first released. I have to start this preview, however, by making a confession: I am not the type of player Kinect Star Wars is aimed at, the reason being that I am one of those curmudgeonly souls whose love of the Star Wars franchise was obliterated by the prequels. For me, any defence of nearly every Star Wars IP released after The Phantom Menace can be stopped dead in its tracks by uttering the words, "Jar Jar Binks". So the fact that Kinect Star Wars is set during the same time period as the prequel movies was something I had to put to one side for my hands-on preview of the game. The demo began with a brief tutorial courtesy of Yoda, who was inaudible over the din at the showcase event. Thankfully, a Microsoft representative was on hand to yell over the noise if I got into any trouble and both he and Yoda took me through the game's easy control scheme. 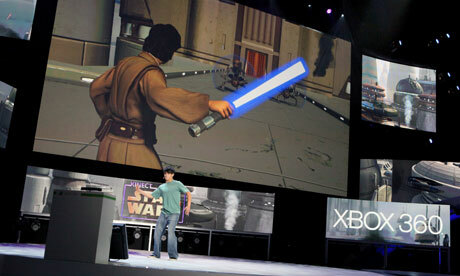 Players wield a lightsaber by making cutting and thrusting motions with their right hand. They can also use it to deflect laser beams shot at them from oncoming foes. Their left hand allows them to use The Force to lift enemies into the air and knock them over. They can also use their feet to kick opponents down, provided they're close enough. Finally, by leaning forward, players can make their Jedi sprint across environments.